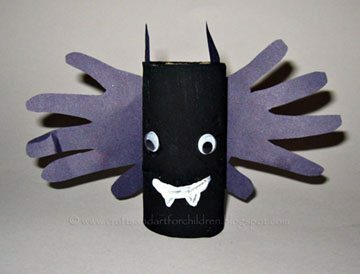 Have the child paint the toilet paper tube black. I held the tube up for my son to paint around it. Trace the child’s hand onto black paper and cut it out. We traced my baby hands. Glue onto the backside of your bat to make the wings. Cut 2 triangles from black paper and glue on at the top for ears. Use white paint to draw on a mouth with teeth (I did this part). Paint on a mouth with 2 teeth. I link up to these link parties! I would love it if you would link up to my kids activity party…Hey Mom, Look What I Did at Adventures In Mommy Land. Using the baby&#39;s hands is so cute!